Home / Asia / International / Travel and Living / Dubai Fine Print-Fine for Everything! This one is no brainer and applies worldwide. Not respecting traffic light can cause major accidents, still many drivers think it is OK to drive ahead. 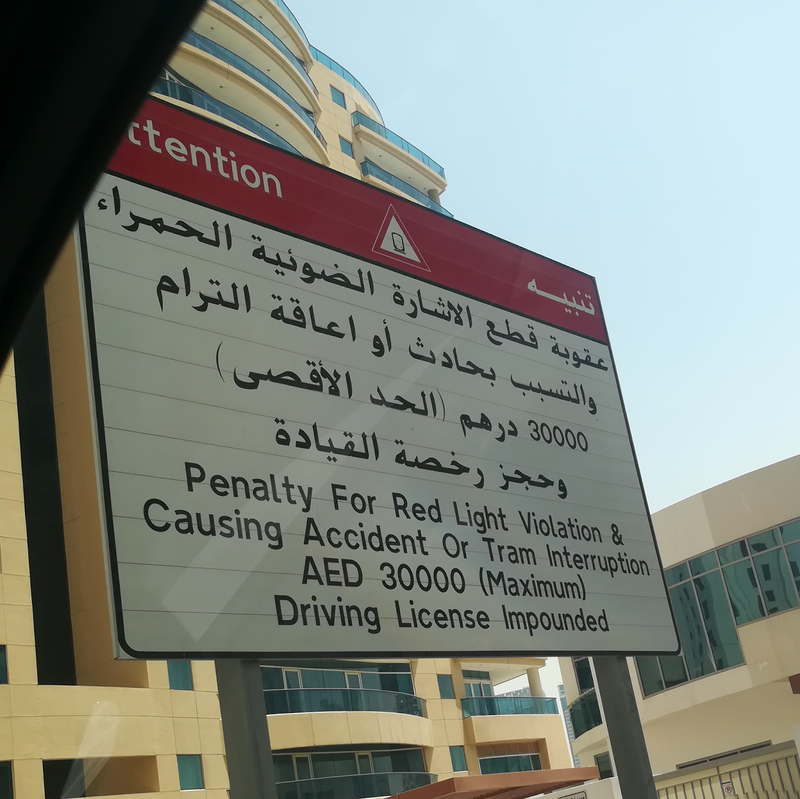 In UAE such violations have zero tolerance and will result in hefty fine and suspension of driving license. Of course every country in the world has similar rule- you're not supposed to move when there's red light. But enforcement is very lax in developing countries. The warning display doesn't indicate how much is the fine if someone jumps red signal but doesn't cause any accident, but I am sure it will be in several thousands. 2. Crossing the road instead of using foot over bridge. Using Foot over bridge is a safe way to cross the road. 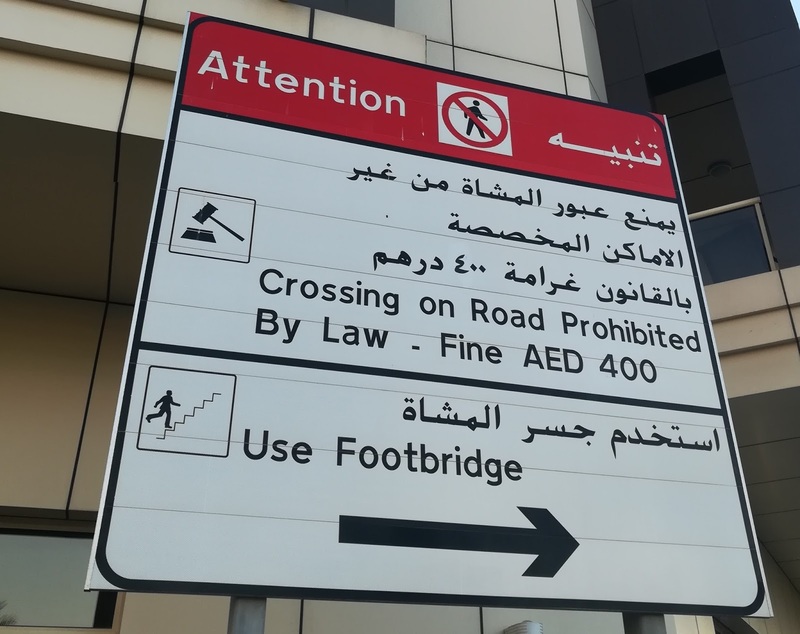 But it involves some additional walking, climbing stairs etc (elevators are available in Dubai FOBs), thus many find it easier and quicker to just cross the road where they are. But drivers driving at high speeds won't be expecting pedestrians crossing the road when there's FOB. Sudden appearance of a person crossing the road will force driver to brake hard, often causing accidents- even a multi vehicle pile up. Thus it is not safe to cross the road at random places. But unlike red light rule which is enforced worldwide, fines for pedestrians is a bit rare, but trust Dubai authorities to track you down and penalize you if you dare to violate these rules. Trains, buses, escalators all have an emergency stop button. 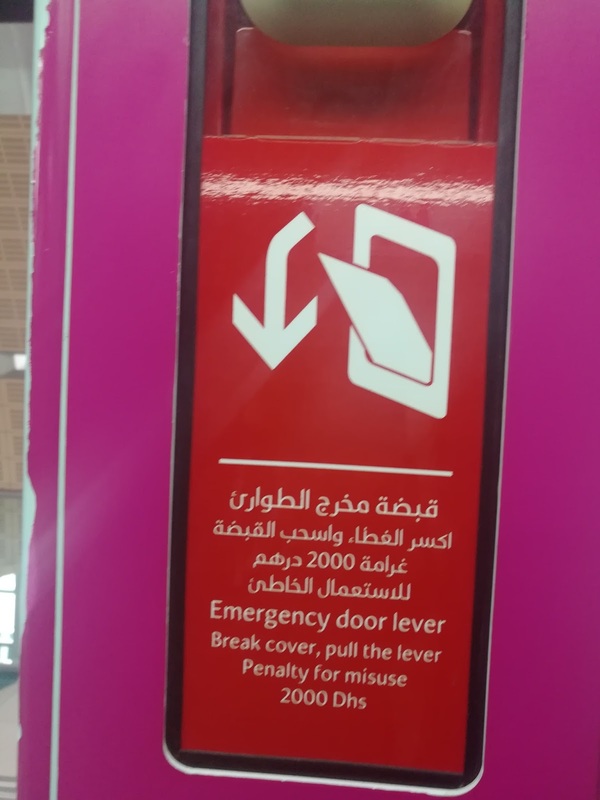 Pressing this will stop the system, causing inconvenience to other users and will need emergency/maintenance personnel to arrive at the scene, inspect and reset. If you abuse this feature by pressing it without a real need (emergency) be ready to shell out big fine. 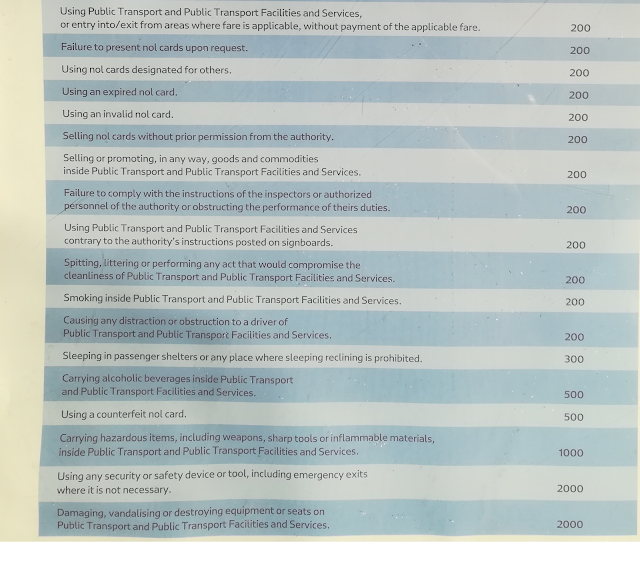 Even Singapore metro enforces up to 2000 SGD fine for misuse. A 100 dirhams if you're caught violating these basic ethics inside metro. Fair enough. 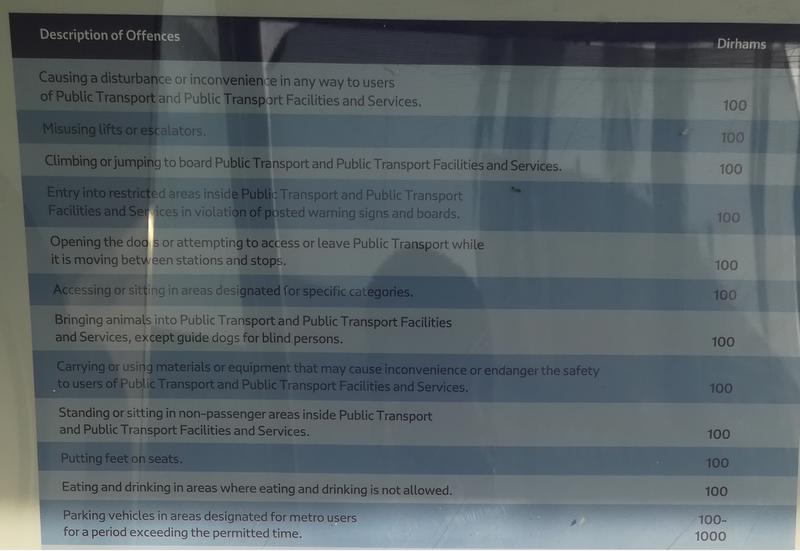 The air conditioned bus passengers waiting area had a complete list of how much fine for various offences. Fine ranges from 100 to 2000 dirhams.. In India one can get away without paying a penny, even if they burn the entire bus. I wish to see these enforced in India asap- anyone caught damaging public property should be made to pay for it. Identifying who damaged a bus is not that difficult- CCTVs, media footage, footage by random public can help identify who caused the damage. This is Dubai's latest menace or nuisance. 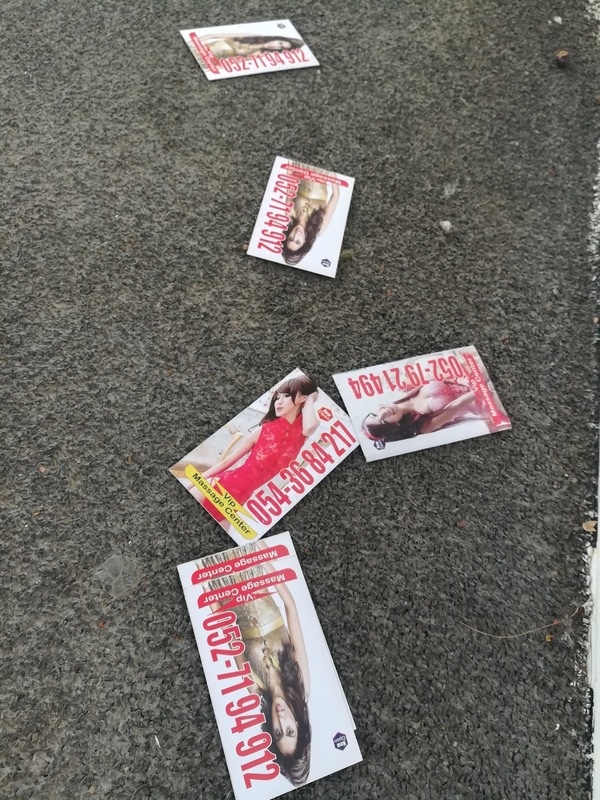 Several immigrants have resorted to this illegal massage business and to get customers spray their "business cards" on the ground in public places or on the windows of cars and so on. Earlier those caught doing this only had to pay a small fine for littering public places. Now this is considered a more serious offense and those found guilty will be jailed if they are UAE nationals or will be deported immediately if they are from other countries. 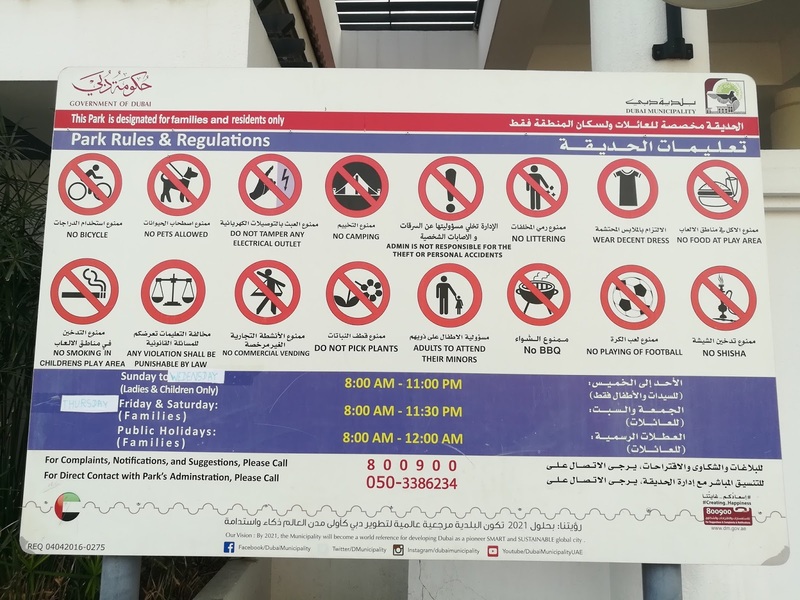 Apart from these, those running business in Dubai need to comply with very stringent rules w.r.t hygiene, safety etc or else face hefty fine. The rules are there for a reason. Following them is in everyone's best interest. These are what I could spot during my short visit. If I find more I will update the post. If you have any input/experience to add, do share. Waiting for more post from your Dubai trip.